“Modern” mass transit came to Chicago on October 2, 1890. 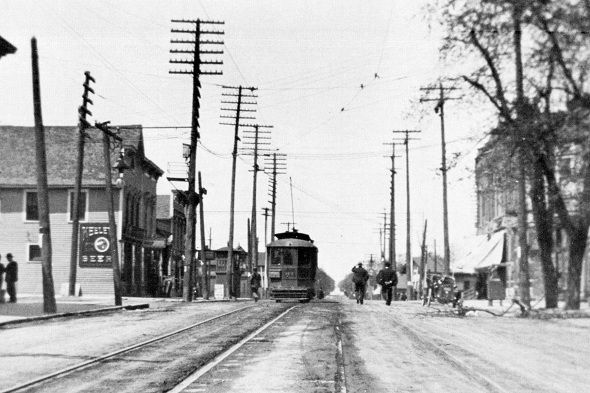 On this day 122 years ago, an electric streetcar line began operating on the South Side. Back in 1859, the city had gotten its first street railway. Rails were sunk in the middle of State Street, between Randolph and 12th Street (Roosevelt Road), and horses pulled iron-wheel carriages along the track at three miles-per-hour. It wasn’t any faster than walking, but why walk when you could ride? 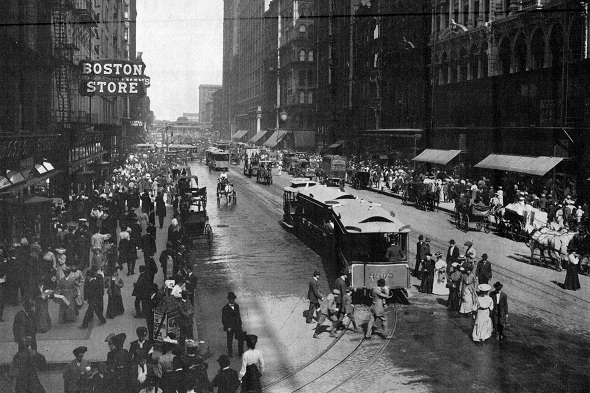 The State Street horsecars proved popular, and the line was soon extended. Service was also added on other major streets. 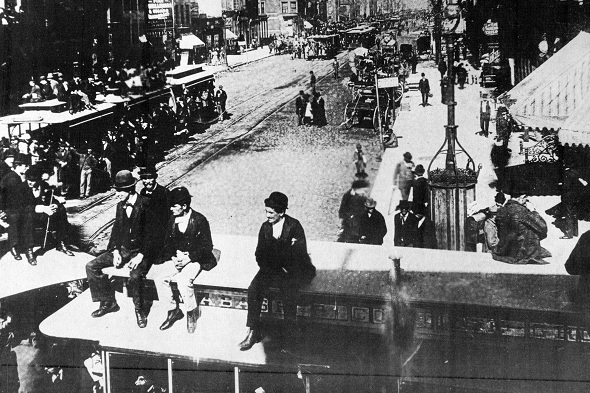 Cable cars came to Chicago in 1882. First developed in San Francisco, the idea involved having a continuously-moving cable sunk in a slot between the tracks, pulling the car along with it. Within a few years, Chicago had the largest cable car system in the country. The later 19th Century was the age of electricity. Cities were beginning to string overhead wire for street lights and telephones. Naturally there was talk of running street railway cars using electric power. After a few false starts, a successful electric car line was launched in Richmond in 1888. A live electric wire was strung over each set of tracks. A pole on top of the car connected to the wire, gathering power to run the car’s electric motor. 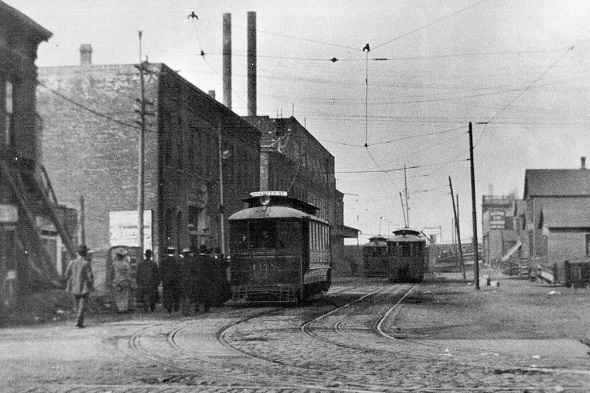 The pole was known as a “trolley,” so the new vehicles were often called trolley cars. Chicago had many privately-owned transit carriers in 1890. The bigger companies seemed satisfied with horses and cables. It took a scrappy little outfit called the Calumet Electric Street Railway to bring in the new technology. 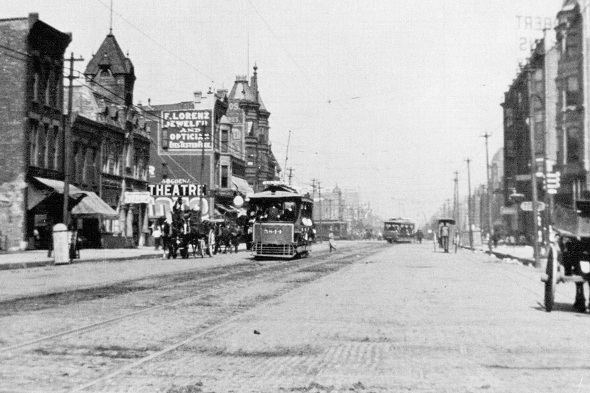 The city’s first electric streetcar line ran on 93rd Street between Stony Island and South Chicago avenues, in the Calumet Heights neighborhood. In 1890 this was a sparsely-settled district that had been part of Chicago for only a year. There was hesitation about bringing the new trolley cars into the denser parts of the city. But the trolley cars were triumphant. They were cleaner, faster, and cheaper to run. In 1893 the larger companies began converting to electric power. The transition took some time. Until overhead trolley wire was allowed in the Loop, the electric cars had to towed through downtown by horses. Finally, in 1906, Chicago’s last horse and cable railways were converted to electric power.